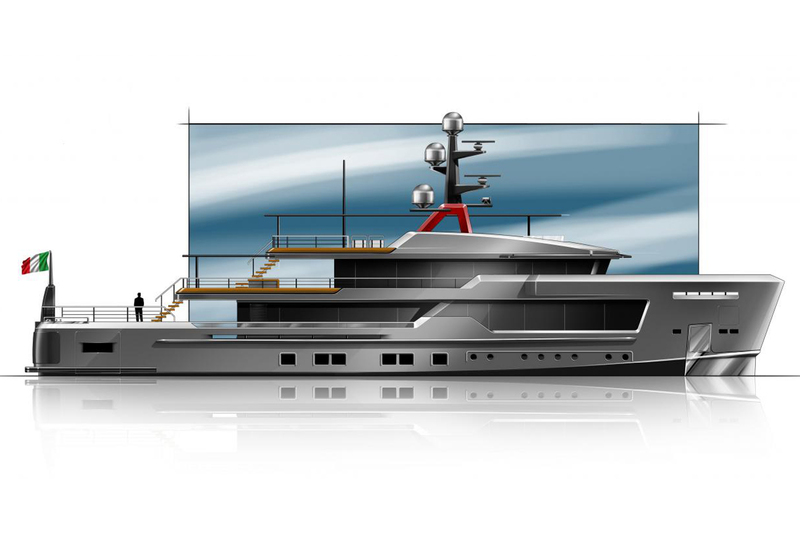 CRN unveils the AlfaRosso concept, an innovative explorer yacht designed by Francesco Paszkowski Design, available in three lengths – 45, 50 and 55 meters – with a gross tonnage from 499GT for the 45m model. Designed for an owner who loves long voyages of discovery to remote places, the AlfaRosso concept finds expression in a displacement yacht where contact with nature is elemental. The magnificent craftsmanship of this yacht is displayed both indoor and outdoor. The star here is teak wood, which forms a bridge between tradition and innovation. In the sumptuous indoor spaces, the continuity between interior and exterior is exquisitely expressed in the understated elegance of the steel handrails, chosen in place of the classic gunwales, in the sophisticated minimalism of the open-step stairs linking the various decks, and in the sense of consummate relaxation exuded by the flush-deck pool on the main deck. These details bring guests into closer contact with the sea and the air, removing any barriers that might hinder the fullest enjoyment of the onboard experience. The tender and all the toys are stowed in the bow area to keep the surface area clear and clean while further emphasizing AlfaRosso’s dynamic personality and her owner’s passion for exploration.